A South Korean medical team flew into in Laos on Sunday to assist with recovery efforts following the deadly flooding that resulted from the collapse of a dam that was under construction by a Korean builder. An emergency relief team composed of 15 medical personnel and five support staff arrived at Pakse International Airport in Champasak Province, southern Laos, at about 6 p.m. (on local time) aboard a Korean military plane. 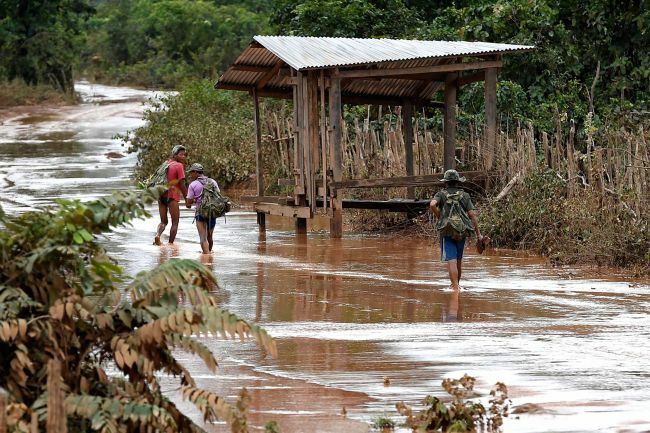 They are on a 10-day mission to treat displaced residents in the rain-lashed southern Laotian province of Attapeu and prevent the spread of contagious diseases, according to the South Korean foreign ministry. A dam built on a mountain saddle of a larger hydropower dam project gave way on Monday. SK Engineering & Construction, a South Korean firm, is a partner in the project. The dam is one of five auxiliary dams in the Xepian-Xe Nam Noy project, which collapsed, flooding seven nearby villages and displacing more than 6,600 people. The flooding killed at least 27 people, leaving more than 130 missing, according to local media reports. "The role of a humanitarian mission is important as this disaster also involves a South Korean firm," said Roh Dong-whan, the leader of the relief team. "We'd like to provide assistance to affected residents warmly and actively." The team plans to install a base camp, possibly on Monday, at a health service center in the Sanamxay town of Attapeu Province and work in cooperation with the medical staff from the provincial hospital. "We're going to move quickly with a goal of setting up a clinic there tomorrow," Roh said. "We will also dispatch our medical personnel to the provincial hospital upon request." The team is the first South Korean emergency medical team to be dispatched since 2014, when the government sent a team to Ebola-hit Sierra Leone. In rescue efforts, the government will provide $500,000 in cash and $500,000 worth of materials to help Laos recover from the disaster. 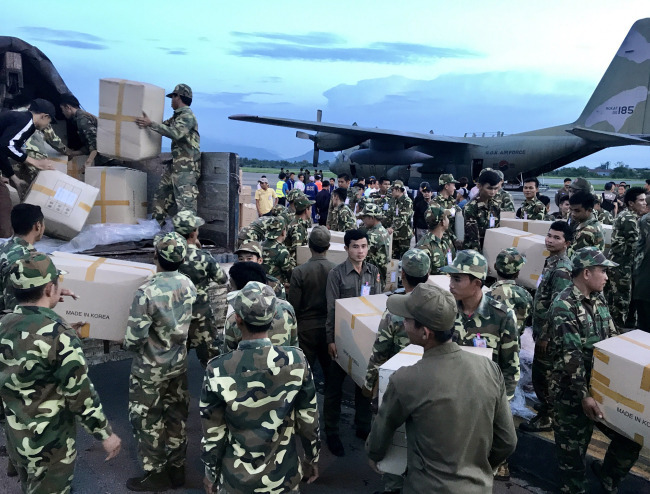 Two Korean military aircraft carrying relief supplies arrived in Laos Saturday (local time) via the Philippines, according to government officials. The supplies include 1,200 blankets, clothing and sanitation items provided by the government, the South Korean Red Cross and SK Engineering & Construction Co. (SK E&C), the ministry said. The supplies will be delivered to the Laotian authorities with South Korean Ambassador to Vientiane Shin Sung-soon and Leth Xaiyaphone, the governor of Attapeu Province, attending the handover event. Shin said that Laos is apparently viewing the heavy rains as the cause of the dam collapse, but it is also focusing on the possibility of faulty construction. "The Laotian government seemed to think that even if heavy rain came down, (the dam) should have been constructed in a way to withstand the deluge," the envoy added. Meanwhile, SK E&C said it is in the process of building lodgings for 150 households currently being accommodated at three schools. The builder said that the 200 workers sent to the country are working without rest and are moving swiftly to distribute 2 billion won ($1.78 million) worth of relief supplies to those affected by the flooding.